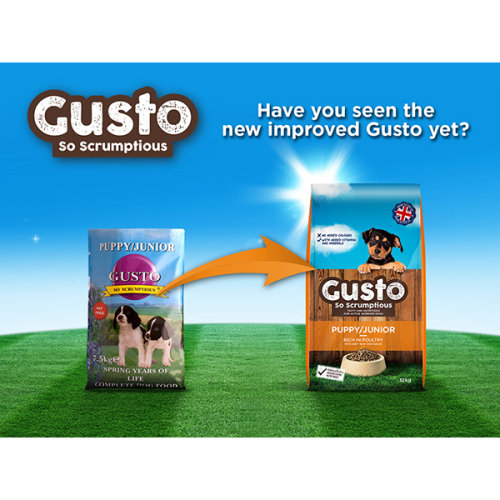 Gusto Complete Puppy & Junior Dog Food is a highly enjoyable delicious recipe that's rich in poultry with beef, added vegetables, vitamins and minerals. With functional fibres to help support healthy digestion. No added colours. Can be fed dry or moistened with water or gravy to the consistency your dog prefers. Puppy & Junior diet has been formulated by a leading canine nutritionist to offer the best balanced and nutritional diet for puppies and young dogs, with 26% protein and 12% fat. Ideal for typical breeds of working dogs, this food is formulated to meet the extra nutritional needs of growing puppies and young dogs. Cereals, Meat & animal derivatives (min 14% poultry and 4% beef meal), Oils & fats, Derivatives of vegetable origin, Vegetables (min 4%) & Minerals.